The web site “Natural News” is a prime source of information for alternative and “natural” health enthusiasts. It promotes a lot of misinformation on fluoridation and is often cited by anti-fluoridation propagandists. 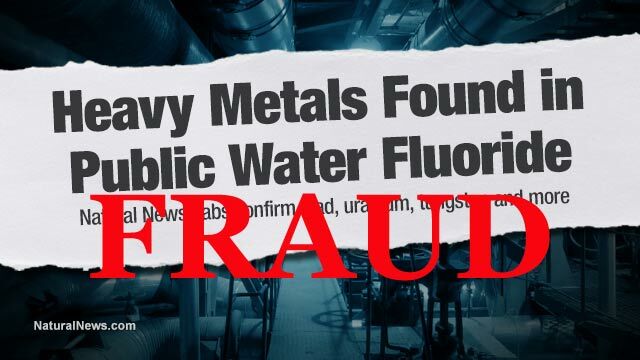 So – no surprise to see a recent campaign in social media promoting a Natural News article Natural News exclusive: Fluoride used in U.S. water supplies found contaminated with lead, tungsten, strontium, aluminum and uranium. The article was dutifully tweeted ad nauseum and of course local anti-fluoride campaigners also dutifully and uncritically promoted it. But no-one actually looked at the data in the article to see if it was in any way meaningful or supported the claims of contamination being made. In fact, it is just another example of the sort of misrepresentation I referred to in the article Fluoridation: emotionally misrepresenting contamination. That is, people getting hysterical about contamination data which actually show very low levels of contaminants. Getting hysterical about numbers just because they are numbers without any understanding of what they mean. Mike Adams, who calls himself the Health Ranger, wrote the article which pretends to be a scientific investigation of contaminants in 6 samples of sodium fluoride obtained from Chinese sources. He reports the maximum and average values of a number of contaminants. Of course he uses parts per billion (ppb) because that gives him larger numbers by a factor of 1000 than the usually used parts per million (ppm). I will convert his values for readers and compare them with values found in Australia and New Zealand for contaminants in fluorosilicic acid, the most commonly used fluoridation chemical (actually fluorosilicic acid is also the most commonly used fluoridation chemical in the USA – so its strange that the “Health Ranger’ didn’t analyse that). The table below compares “the Health Ranger’s” analytical values with those for fluorosilicic acid reported in my article Fluoridation: emotionally misrepresenting contamination. Also included are the regulated maximum values for these two fluoridation chemicals. I have included only values for arsenic and lead as these are the only ones of “the Health Ranger’s” list included in New Zealand regulations (see NZ Water and Wastes Association Standard for “Water Treatment Grade” fluoride, 1997). So, “the Health Ranger” produces hysterical headlines for fluoridation chemicals using figures showing extremely low levels of contamination! They are even low in comparison with the fluoridation chemicals used in New Zealand and they are certainly very much lower than the local regulated maxima. And don’t forget that these concentrated chemicals are diluted millions of times over when added to drinking water. Yes, I know, there are some people who think any measured value is too much. But put this into context. Even the most pristine water or food will contain (very low) levels of contaminants if we use an analytical method that is extremely sensitive. That is why we should check claims of contamination by comparison with “uncontaminated” material and regulated maximum values. We must put the numbers into context. To put the situation of fluoridation chemicals into further context contribution of contaminants to drinking water from other sources should be considered. In Fluoridation: putting chemical contamination in context I compared the amounts of arsenic contributed from fluoridation chemicals to local drinking water (Hamilton City in the Waikato) to the arsenic already present in the source water from the Waikato River. The figure below shows any contribution from the fluoridation chemicals used is miniscule compared with the natural levels already in the water. I won’t comment on the other heavy metals “the Health Ranger,” (who describes himself as the “lead researcher” in this pathetic study) mentions as they are not covered by local regulations. However, the certificates of analysis for fluorosilicic acid included in my article Fluoridation: emotionally misrepresenting contamination all reported Uranium at levels < 2 ppm. “The Health Ranger” reported a maximum of 1.4 ppm and average of 0.2 ppm. Not so impressive in ppm – you can see why he prefers ppb. Cleary another scare-mongering article from Natural news. It is accepted uncritically by anti-fluoride activists and heavily promoted by their propagandists. But it is worthless – some would say fraudulent. This sort of fraud going on in the “natural” health movement needs to be widely exposed. The ordinary reader has no way of evaluating these claims or the numbers involved. However exposure of these sort of fraudulent articles will help readers be wary about future claims from these sources.